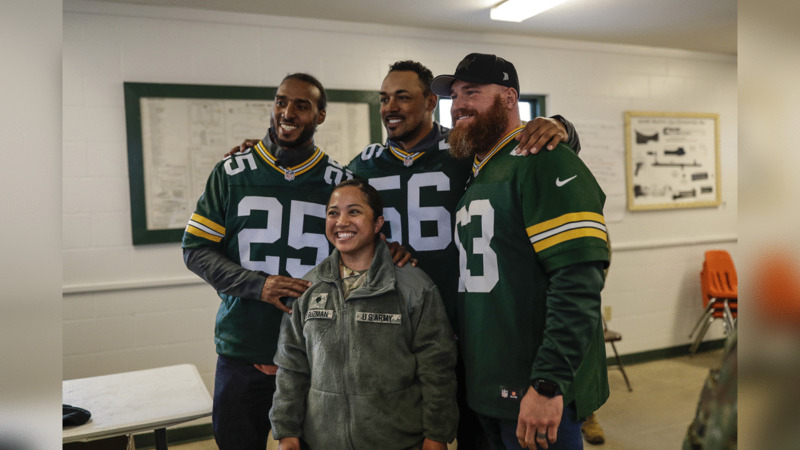 The 14th annual Packers Tailgate Tour came to a close Saturday afternoon in Antigo with more than 500 fans on hand to support Habitat for Humanity of Langlade County. The organization works to develop communities with people in need by building and renovating houses so that there are safe, decent homes. Founded in 2001, Habitat has since built eight homes in Langlade County, with an average of one home a year. A new Critical Repair Program that makes small exterior repairs on the homes of low-income families was established in 2015 to further assist the needs in the area. Angi Schreiber, executive director for the organization, was very pleased with the event and the money raised, but also with how it has helped further educate the public about the organization. The Antigo Red Robins High School football team was on hand to support the event as well and had the opportunity to pose for a photo with the Packers team on hand. During the Q&A portion of the event, a fan asked Ryan Grant about the support he gave Ryan Luxem back in 2010 when the 11-year-old fan was suffering from an advanced stage of leukemia. Luxem eventually succumbed to the disease and Grant started a scholarship and event, Ryan4Ryan, to honor the boy and his family. This fan was so inspired by Grant’s effort that he named his son after the running back. As the trip wound down, members of the tour reflected on their week’s experience, as has become custom. Scott Wells: “It was a great experience. Living here for seven years I didn’t see as much of the state as I did on this trip, and I regret that. I wish I had. “Children’s Hospital and the VA were two of my favorites. Children’s hospitals that are not in the major cities will sometimes get overlooked. So it was good to interact with families we saw. It was very personal to me. The veterans were great to visit as well, and the assisted living home; they’re often forgotten. To give back to them and see an emotional reaction, it really touches my heart. Aaron Kampman: “I frame the week in two ways. One was our experience with the Packers staff and our player friends. One part we haven’t talked about is how we got to know the staff. I was able to spend time and get to know Mark Murphy better. That part can get lost in the shuffle. We get to know each other better and build the team for a week. Bernardo Harris: “I can’t believe it’s over, but I can’t remember Tuesday, either. It was a great week, a blessing to represent the Packers organization. It was a pleasure to meet fans and put smiles on faces. To see their passion for team, the community and the state was outstanding. You hope that the fans have a great memory from this. Like the 90-year-old lady who we were able to visit with. She knew her stuff and now she had chance to meet some players. The 3-year-old girl at Children’s Hospital to the older fans, they were a privilege to meet. Earl Dotson: “It was amazing to have chance to travel Wisconsin and interact with the fans. We didn’t get the chance to do that while we were playing, to talk to them and take pictures like we did on this trip. I appreciate seeing the state that embraces the players as family. It was great to let the fans know they are No. 1, to let them know we appreciate what they did for us. “I loved being with the guys and getting to know the guys from the next teams. I’d do it again in a heartbeat. Experiencing the camaraderie and locker-room feeling again was fun. Ryan Grant: “It was very cool and really good to reconnect with some of the guys and laugh about stuff. To see an honest perspective now, and not as players, was great. “New Richmond stood out with what they did. Al Stachura (the motor coach driver) was the MVP of tour, getting us through the weather. “The dynamics I always like is the current players mixing with the alumni. I missed that, but with younger and older alumni getting to know each other better, we enjoyed a bit of that. 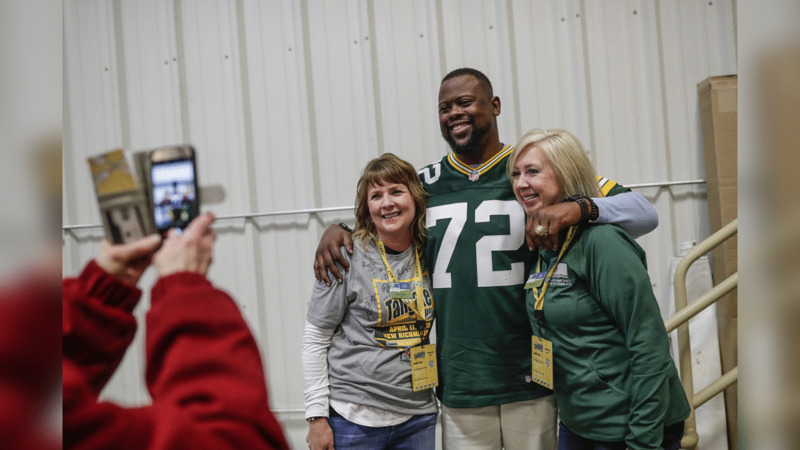 After five days, 792 miles and sometimes challenging weather, the Packers Tailgate Tour completed its mission to say thanks in person to fans around the state, as well as raise money for many worthwhile nonprofit groups in the process. And in addition to the now nearly $3.5 million raised over 14 years, the Tour has helped groups greatly further the awareness the public has about their efforts, a benefit that will continue to provide support into the future. 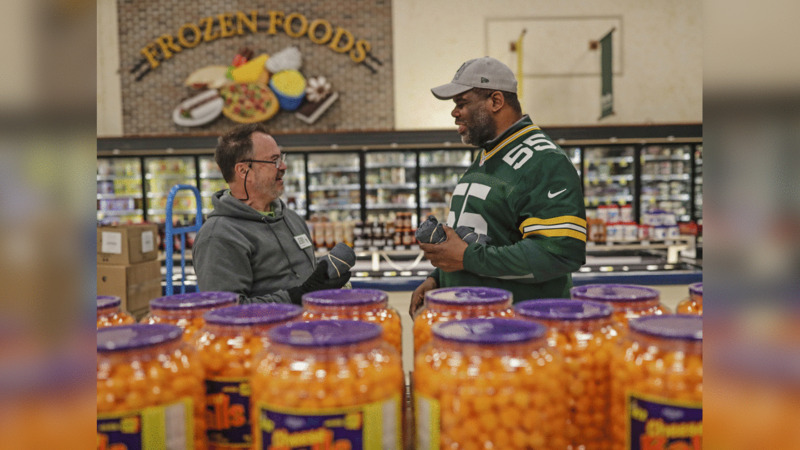 A Saturday morning outing to the local grocery store might be a mundane task, but for shoppers at a Wausau Pick ‘n Save , it was anything but routine as they were greeted by the alumni and Mark Murphy with smiles and gift cards. Some or the Tour members even pitched in by bagging groceries, displaying some latent skills. The motor coach continued east to Antigo. The Moose Lodge in Bloomer was the site of a fundraising lunch to benefit the Bloomer Police K-9 Unit and its dog, Argo. 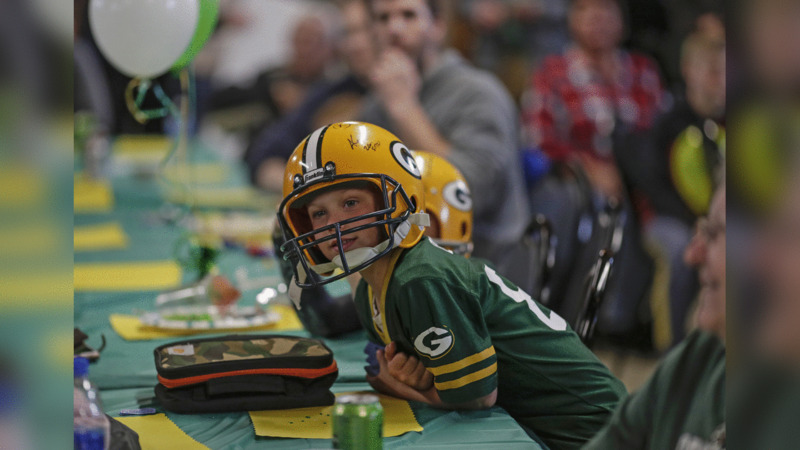 A classic hall in the tradition of the Loyal Order of Moose, a fraternal and service organization founded in 1888, the setting was a perfect place for community members to come together and hear from the Packers and support unit. K-9 officer Brandon Poppe was thankful for the opportunity to receive support for the program that has become a key component of their force, offering tracking and drug inspection services for Bloomer and other communities in the region. A regular feature of these gatherings for the attendees is having the opportunity to ask questions of Mark Murphy and the alumni, and a popular topic this week has been favorite memories of the alumni of their playing days. Earl Doston recalled returning home from Super Bowl XXXI, which was played in warm-weather New Orleans, to a chilly Green Bay. “Return to Titletown” featured a bus ride – with open windows so the fans could better see their NFL champions – through downtown Green Bay on the way to a celebration at Lambeau Field. On the subject of what the players are doing in their post-playing days, Nick Barnett had a playful answer. At the end of the lunch, the team presented a $2,000 donation in support of the unit. Later in the afternoon in Chippewa Falls, the group transitioned into the Tailgate Party portion of the day with a VIP event inside the famous Leinie Lodge on the Leinenkugel Brewery campus. Outside in a sprawling tent, several hundred fans were ready to kick off the event to benefit Chippewa River Industries (CRI), an organization that empowers individuals with disabilities and other barriers to achieve independence by providing meaningful employment. It operates on a social enterprise model that has been successful and sustainable. CRI’s CEO Dave Lemanski beamed with pride as he surveyed the scene, very pleased with what his team of volunteers accomplished in getting the site ready for the party, an effort that included re-erecting the tent early Friday morning after the spring snow storm collapsed the structure on Thursday. As the alumni signed autographs and Murphy mingled with fans, the popular Milwaukee-based cover band The Love Monkeys infused energy into the event and had fans enthusiastically singing along with favorites from the 1970s, '80s and '90s. Local residents appreciated having the team in town for the event. “It’s great to have the Packers here,” said Jenny Miller of Chippewa Falls, an attendee who has an affinity for CRI that is rooted in a family history of adult foster care, with a father and grandmother who hosted adults. As for the Tour overall, the alumni continued to be impressed with enthusiastic support of the fans. The Tailgate Tour’s final day will see the motor coach head back east toward Lambeau Field, with stops in Wausau and Antigo. 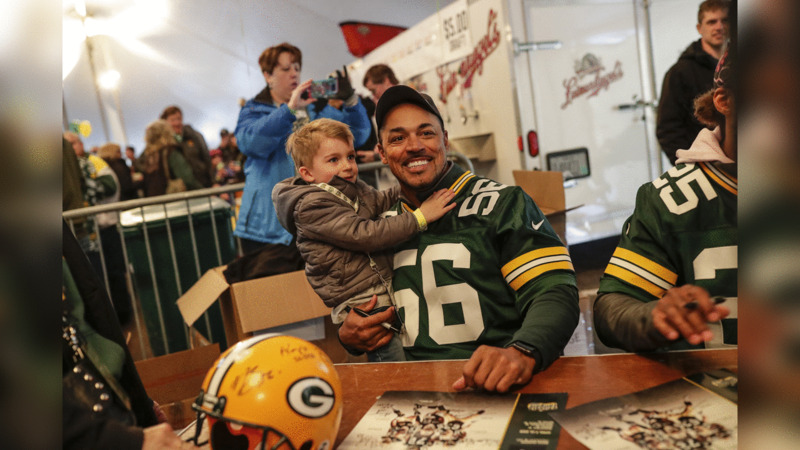 The snow continued to fall in western Wisconsin as the Packers Tailgate Tour began Day 4, but that didn’t dampen the spirits of the alumni and Mark Murphy as they looked forward to the journey to Chippewa Falls. “Very light, nothing compared to yesterday,” said Murphy. A nimble crew well versed in calling audibles, the team was able to adjust its schedule again to make up for a stop that was missed yesterday with a surprise visit at Rise, a New Richmond organization that unlocks potential and opens doors to success for people with disabilities or other challenges through creative solutions and customized support. Tour members had the chance to pose for photos and sign autographs with the adults who work there. Another surprise stop was made in the morning, with the alumni and Murphy crashing a tailgate party at the Deerfield Senior Living center in New Richmond. After introductions, the players had an opportunity to answer some Packers trivia questions. 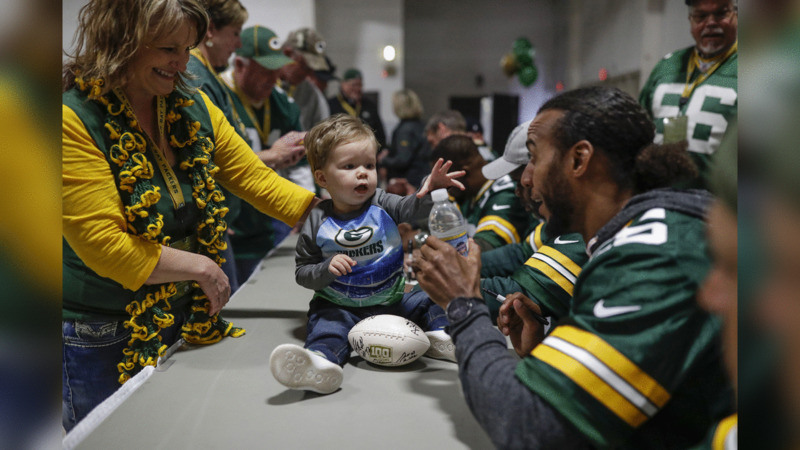 Rather than traditional facts and figures about the team, the questions dealt with some lighter topics, such as what was the material used to make the first cheesehead (a couch cushion) and favorite foods of the alumni from their time in Green Bay. “A bar near where I lived made great cheese curds,” Nick Barnett revealed. “Uncle Mikes was a great place for me,” said Aaron Kampman of the popular bakery that has a handful of locations in the Green Bay area. “Stadium View chicken wings,” said Earl Dotson. “Broasted chicken," reported Bernardo Harris. “Cheese curds and Spotted Cow,” Scott Wells said. 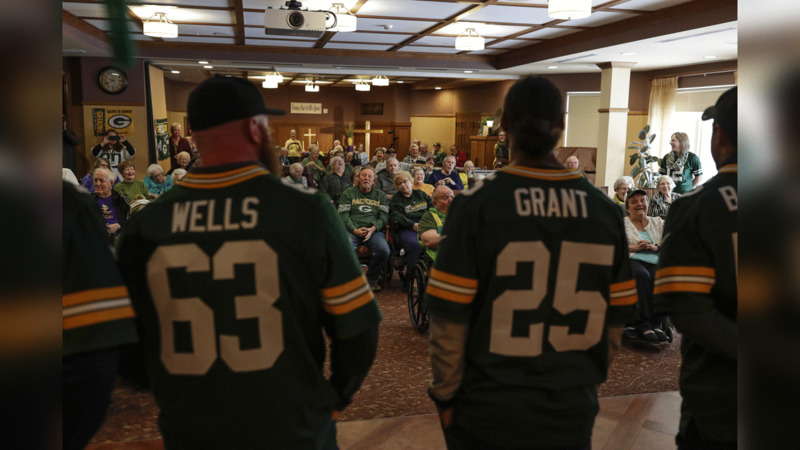 Before departing the facility, some of the alumni delivered Packers-themed doughnuts to rooms of residents that were not able to join the party. In what was billed as the Ice Bowl 2.0, on account of the weather, of course, nearly 2,000 people filled the hangar at East Metro Jet Center in New Richmond for a tailgate party to benefit Grace Place Shelter, a Salvation Army Shelter that provides stability to low income families and individuals in St. Croix, Pierce and Polk Counties by offering services that address their needs. Angela Moulton, the fundraising manager for Grace Place, was all smiles as she took in the active scene. “This is awesome,” she exclaimed. “I’m so excited the Packers picked us for a tour stop. The weather didn’t keep too many people away. And for those that weren’t going to come, we received calls asking how they could still make donations to support the event. Beyond the party’s regular features, the event had a concert featuring Chris Kroeze, runner-up from Season 15 of "The Voice." Originally from nearby Barron, Kroeze offered his services to help support the event. To involve the crowd with the concert, organizers recruited event attendees with beards to come up to stage for a contest. The one with the best beard would have the honor to introduce Kroeze, himself a possessor of a fine beard. The invite caused Scott Wells to jump up from the autograph table and run onto the stage to make sure his beard could be considered. For local resident Justin Curran, all the elements of the party were a clear demonstration of the community’s willingness to support a great cause of its own. Curran, a Packers fan who has also lived in Michigan, has a special connection to the team. He lives in the childhood home of Johnny "Blood" McNally, the former Packers back and Pro Football Hall of Famer, who grew up in New Richmond. He bought the house about five years ago is meticulously refurbishing the home. “One board at a time,” Curran said with a laugh. The party also took a moment to honor Duana Bremer, Salvation Army’s director in St. Croix, Polk and Burnett County. Jessie Garza, the district director for Congressman Sean Duffy, presented Bremer with Congressional recognition in honor of her efforts in the community. Members of the Tour were impressed with the organization and turnout. “There was great energy there tonight,” said Aaron Kampman. “You could tell they really appreciated it. They were thanking us as they came through the autograph line. We should be thanking them. Outstanding event, overall. Although the weather caused the day’s schedule to be a bit catawampus, including a two-hour drive that turned into four and a half, the Tailgate Tour made the most of the afternoon with a stop at a 3M plant outside of Menomonie. 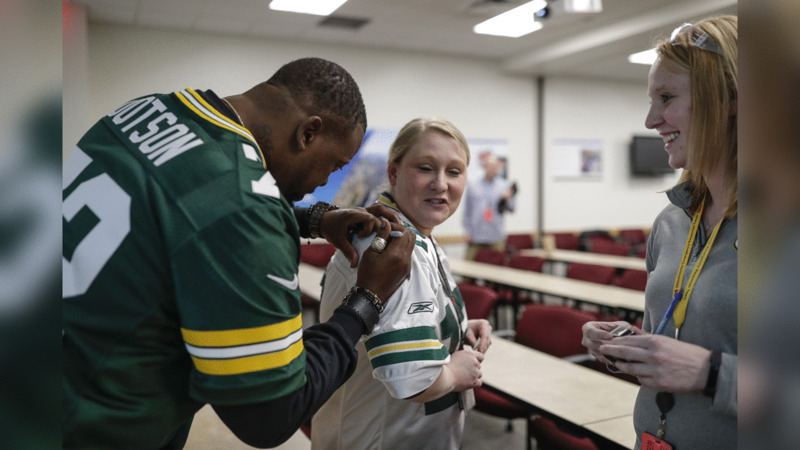 In what has become an enjoyable component of the Tour, members make a stop at a workplace that is along the day’s route, simply to say thanks to fans and experience companies that are part of the Wisconsin workforce landscape.  After enjoying some mingling and popcorn, the members of the Tour had the opportunity to talk about the current state of the Packers as well as answer some questions. And, as has also become custom, give some good-natured grief to a fan of another NFL team. Being in the western part of the state, a Vikings fan was in attendance. “Wow, a Vikings jersey. Have the Vikings come through on a tour and stopped to say hello?” Mark Murphy asked, as the room erupted in laughter. Later, Aaron Kampman chose to pile on a bit when he answered a question about who was his favorite quarterback to sack during his career. “Whoever was starting for the Vikings,” he deadpanned. After the visit, the motor coach safely made it to the hotel, plowing through a snowdrift or two, for some down time before the evening’s event to benefit Grace Place Shelter, a Salvation Army Shelter. Well, the much-anticipated Winter Storm Wesley indeed packed a punch and the Tailgate Tour on Day 3 is adjusting its schedule. What was supposed to be a surprise stop for 800 students at the middle and high schools in Black River Falls unfortunately was cancelled as schools across the central and northern parts of the state were closed. But, the school will still receive a $2,500 check for athletic equipment. The motor coach’s route also was waylaid as accidents on Interstate 94 caused closure of the main thoroughfare. A benefit of the detour, however, is that the tour now has seen some smaller Wisconsin towns such as Whitehall and Eleva while the driver, Al, deftly handled the challenging road conditions. “You guys are not very good,” Nick Barnett said after struggling to interpret the other players’ pantomiming. After an initial round, the effort to recruit a few more players fell flat, too. “I’m good,” Earl Dotson said as he politely declined. “Ah, that’s just for the front of the bus,” Mark Murphy said and passed as well. Roads appeared to be getting a little better as the motor coach continued north and west toward its eventual destination of New Richmond. On Wednesday afternoon, the Tour had two visits centered on our service men and women, the first of which was at the VA Medical Center in Tomah where the alumni and Mark Murphy visited with several veterans in the center’s Veterans Hall. The veterans ranged in age and in service, with some talking about their experience in the Korean War and others speaking about recent deployments to the Middle East. “It’s great to see the care they’re receiving,” said Murphy. After lunch, the Tour made a special stop at the U.S. Army Base at Fort McCoy and visited with about 200 soldiers, thanking them for their service. The alumni and Murphy then had the opportunity to ride in Humvee vehicles to the practice range area of the base. While they didn’t get a chance to use the weaponry, they did get a full explanation of a handful of guns on display, which included an M2 50 CAL machine gun, MK 19 grenade launcher and M240B machine gun. Training that takes place here prepares soldiers to qualify and validate them as a gun-truck crew to use mounted gunnery. “So which one is the Rambo gun?” Nick Barnett asked. The master gunner of the soldiers did confirm the M240B would be the modern-day equivalent of the gun Sylvester Stallone used in the film from 1982. Before departing the base, the Tour group learned the name of the operation was Task Force Fortnite, after the popular video game. A soldier in 2017 had commented that while assigned to this training program, one way of keeping in touch with his kids was to play the popular online game Fortnite. 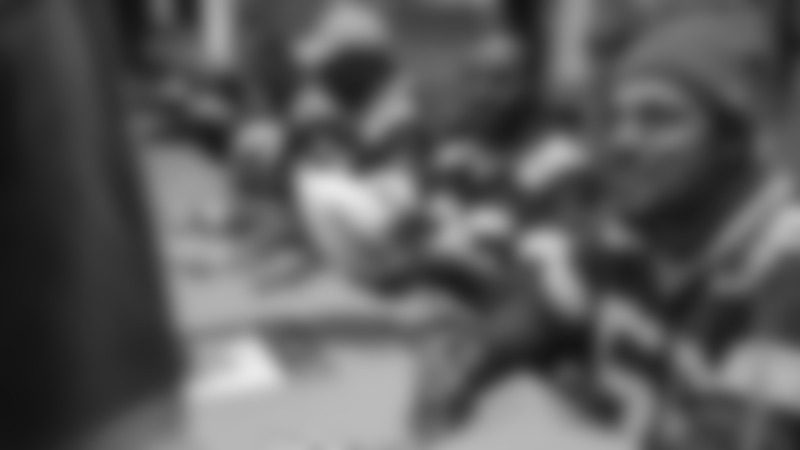 Leaders of the program thought naming the task force after the game would provide another connection to the families of training soldiers and made the request to the game’s developer, Epic Games. Permission was granted and the task force had a new name.